May/June news and the beauty of clover! May gave us enough rain (just in time) and lots of sun so no complaints there. A lot changes in a month, especially at this time of year – all of last season’s crops are finished now & we’re harvesting new season’s spinach, kale, chard, lettuce, salad, new potatoes, polytunnel-grown bunching carrots, spring onions & spring garlic. We’ve planted courgettes & weeded beetroot; both should be ready by the end of the month. We may have a gap in carrots again though, our early field sowing must be very tasty as hard to stop the rabbits eating them! 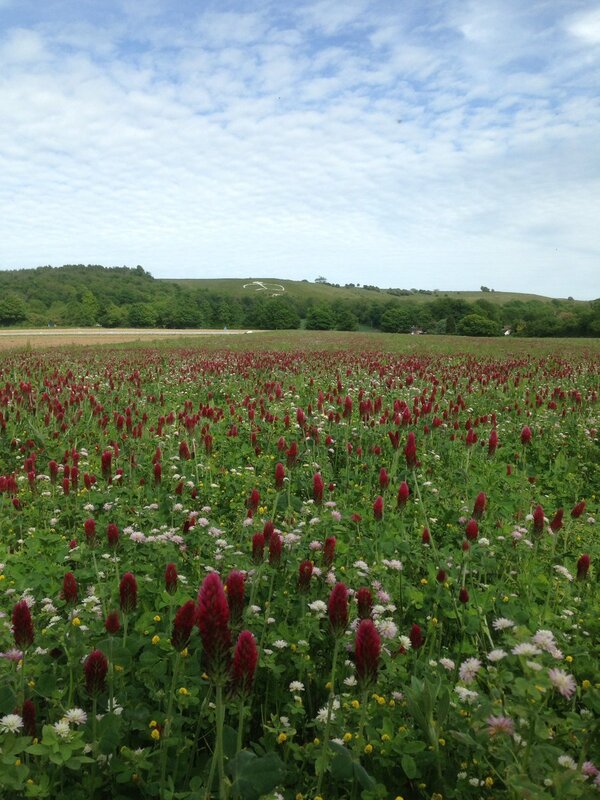 Fertility building with clover – as we rent 100 acres of land near Wye from Imperial College (formerly part of Wye College Farm) we are able to rotate our crops around and only grow veg. on these fields 1 year in 3 and build fertility the other 2 years using ‘green manures’ – sowings of clover and other beneficial crops, which are grown, mown or grazed, and finally ploughed back into the soil. This provides organic matter and adds nitrogen to the soil in readiness for the next vegetable crop. This has the added advantage of fields of beautiful flowers for the bees to feast on and the walkers to enjoy – particularly pretty at the moment with poppies growing amongst the clover. We will have to have them grazed or mowed soon though, as we want to encourage more new growth, rather than letting them set seed, but they’ll be back!